Alma Sasse was a Nancy Drew ghostwriter. She wrote The Mystery at the Ski Jump in 1952 based on the outline by Harriet Adams. 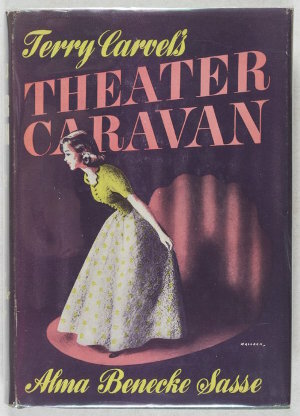 Alma Benecke Sasse also wrote two books under her own name, The Mystery of the Chinese Box published in 1939 and Terry Carvel’s Theater Caravan in 1943. Alma Sasse was born on January 26, 1893 in Brunswick, Missouri to Dora and Frederick Sasse. She attended Vassar from 1911 to 1912, and then the University of Missouri until 1915 when she graduated. Sasse was active in the suffragist movement and also published a handbook for Republican Women in 1920. She lived in Seattle, WA, from at least 1932 until her death in 1967. Both The Chinese Box and Terry Carvel's Theater Caravan are set in the Pacific Northwest. Terry Carvel's Theater Caravan tells the story of Terry, a senior at Stanbrook University in a small town in the Pacific Northwest and how she establishes a community theater in her town. In the foreword to the book, Ms. Sasse thanks the Professor of Drama at Stanford University and Mrs. Florence Bean James, the founder of the Seattle Repertory Playhouse in Seattle, WA. Terry belongs to a single parent household. She takes care of her father who is confined to a wheelchair after an accident. As part of her father's recuperation, he travels to stay with a family member in California and in his absence, Terry rents out rooms in their house. This gives her an income and helps in her quest to establish a community theater in their small town. The book mentions the World War in Europe and the possibility of the United States entering into the war several times. Also, the idea that theater is dying is brought up, the statistic sited is that in 1928, 205 plays were produced on Broadway and in the "last year" (1942?) only 62 plays were produced. Terry creates a summer job for herself running a theater summer camp for local kids. Their first play is Robin Hood. A romantic triangle is suggested early on in the book between Terry, Don, an electrical engineer and Glenn, a fellow actor and lawyer. But there is no follow through, Glenn leaves over the summer and Terry and Don are left alone together and most of the romance in the book is between Terry and Don. Don helps Terry by doing the lighting for her theatrical productions. He also introduces her to the local radio station personnel. Terry talks the owner of the local movie theater into hosting an "amateur night" on Mondays. He agrees only because Monday nights are the slowest nights...sometimes he only has 25 people come to the movies! No one volunteers for the amateur nights initially, so Terry has her young children perform their Robin Hood play. It is a huge success and the Monday night shows lead to the putting on of the winners of the amateur contests to be broadcast over the radio. The whole town becomes involved. All in all, I really enjoyed the book. It was a fun look at the trials and tribulations of creating a community theater in a small town.